Whenever the Academy Awards approach, it's always interesting to look at its history and the extensive list of films that were overlooked by Oscar. This is especially true in the area of costume design. Considering that the Academy did not even allocate an award to costume design until 1948, it's easy to be amazed at the iconic work that was missed completely as a result--Our Dancing Daughters (1928), Top Hat (1935), and Gilda (1946) are but three. Also, at this time, film itself was bouncing back and forth from black-and-white to color, so the related Oscar categories in costume design did the same...starting with two awards and then eventually diminishing down to one. More changes would come in the 1960s when there was a shift toward rewarding costume design in lush period pieces over a modern wardrobe, such as previous Oscar winner A Place in the Sun (1951). As a result, today we can look back and see milestones in the history of fashion in film that were missed, many not even nominated. 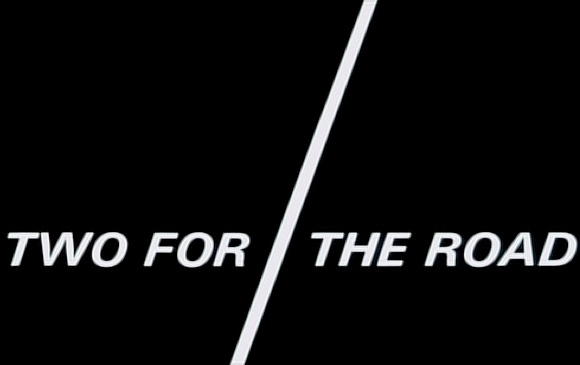 One happens to be Stanley Donen's 1967 dramatic-comedy Two for the Road. Starring fashion muse Audrey Hepburn, this is one of those films that really illustrates how interconnected fashion can be with film. Two for the Road is a showcase of just about every important late 1960s designer. The credits do not even mention them all, though it does list legends like Mary Quant, Andres Courreges, and Paco Rabanne. All were associated with the artistic Swinging London scene...the result of the end of an economic boom in England and a global youth revolution on the rise. The resulting modern--or Mod--design frequently included higher hemlines in colorful A-line shapes and a tremendous amount of experimentation in materials...everything from new synthetic fabrics to metal and plastic. London's Carnaby Street was the center of the fashion universe at this time and Two for the Road featured many of its best designers. 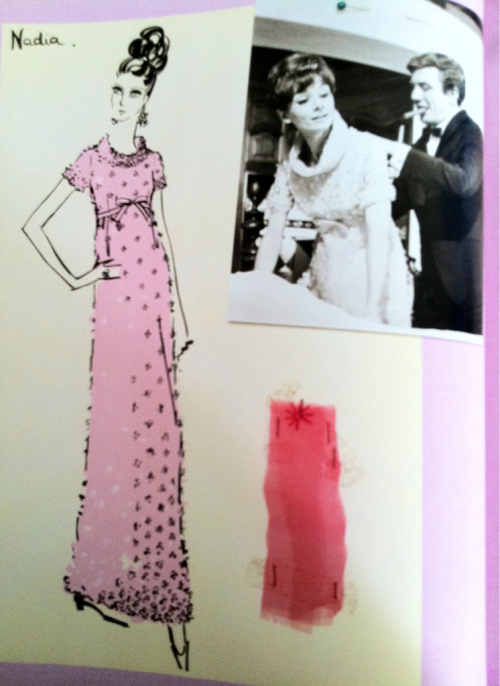 Bringing this cutting-edge ready-to-wear to the screen was no easy task, especially in an Audrey Hepburn film. At the TCM Classic Film Festival, director Stanley Donen spoke candidly about his decision to not use his friend's favorite costume designer--Hubert de Givenchy. Of course theirs was one of the great relationships of all time between designer and star, having worked together since Sabrina (1954) and known for the iconic fashion of movies like Funny Face (1957) and Breakfast at Tiffany's (1961). Though Audrey fought Donen's decision initially, she slowly acquiesced after understanding just how much it would work in her favor to try something new. Interestingly, she was already on that path. Only a year before, she had done How to Steal a Million with Peter O'Toole with a mind to making her image more current. Audrey was strongly associated with the 1950s and that classic style while the world suddenly seemed to be rebelling against both. At the very least, she felt that the definition of 'classic' was evolving and she wanted to, too. So she cut her hair, updated her makeup, and begged Givenchy to push the envelope a bit. One example is the silk side-slit nightie that he paired with a hot pink coat and black patent Wellies for Audrey to drive Peter back to the Ritz. With Two for the Road, she would drop her safety net of Givenchy entirely and show the world she could model the most modern fashion of the day. Even more important, though, is the role of the costume design in the film itself. Set on vacation in the South of France, Two for the Road is about architect Mark Wallace (Albert Finney) and his wife Joanna (Audrey) who examine their 12 year marriage through flashbacks of past vacations. Costume changes galore show Joanna evolve from simple college girl first falling in love to jaded wealthy sophisticate wearing high fashion. Style becomes critical to story as all the cars, clothing, hair styles, and makeup communicate what stage we are in their relationship. And because Givenchy did not design the wardrobe, both Audrey and the audience could delve much more deeply into the character. Though Two for the Road was nominated for an Oscar for its innovative screenplay, it was NOT nominated for its costume design. Today I have tried to right that wrong by naming it one of The Style Essentials on GlamAmor--iconic costume design in the movies that influenced fashion at the time and continues to influence fashion today. This movie made an immediate impact on shoppers in 1967 and today its Mod style is all the rage for Spring/Summer, seen in collections from major designers such as Marc Jacobs and Michael Kors. It's stunning that the parade of ground-breaking fashion on Audrey in Two for the Road--which includes Paco Rabanne's iconic silver paillette dress--was not enough to sway the Academy. Think it's time to make our own vote. I just love that you covered this so-often neglected Audrey film. The clothes are so spot-on-trend as to be a scrapbook of the era and Audrey looks hip in each one, albeit uncomfy. Love your insights and educated guesses. I vote YES for an Oscar for this one! Hooray for Audrey and kudos to Donan for helping Audrey step outside of the Givenchy box! Well-done, Kimberly! I have to admit, when I saw this movie 8 years ago (and haven't seen it since) I was disappointed in the plot....but the only reason I loved it for the clothes. What she wore in this movie changed the way I thought about fashion and I bought large white sunglasses because of her. The other outfit that always stuck with me was the silver sequin dress. Thank you Kay! Even I had somewhat ignored this movie for some time simply because it didn't do Audrey's usual style. But over the years I have really come to appreciate both the screenplay and the fashions through it, especially as they're so significant in fashion and essential to telling the story. Thanks Jessica! I completely understand...it took me years before I really warmed to the plot. It's just a very different tone (especially for Audrey movies) and certainly the way that Donen tells the story is unique. And you've picked out the two things on the fashion side that I loved the best, too! I have photos of me in white sunglasses in Cabo and a vintage 60s silver sequin dress at another occasion that are directly the result of this movie. Thanks again! Thank so much, Henry! I really appreciate you sharing that link and I will adjust the caption accordingly. :) So great! The car next to the Triumph Herald is a blue Renault Floride a stylish French car of the period. Thank you for this post. I have always loved this film - the screenplay, and particularly the clothes.It is one of my favourites of all time and I never tire of watching it. I saw it again on the big screen and it has certainly stood the test of time. I have my own copy on video. The Eleanor Bron character is fabulous. I am a sixties girl and only buy white sunglasses. Anne of Canberra. Australia. Im obsessed with this film! And I'm a vintage eyewear fanatic! I'm so happy to find this post. The iconic white sunglasses "YUHU" were made for Audrey Hepburn by Oliver Goldsmith in 1966. "YUHU" (1966) was featured in "Two for the Road" Exciting news is that the family will release an re-issue this icon Spring 2018! They are amazing! Im obsessed with this film...and I'm a vintage eyewear fanatic! I'm so happy to find this post! 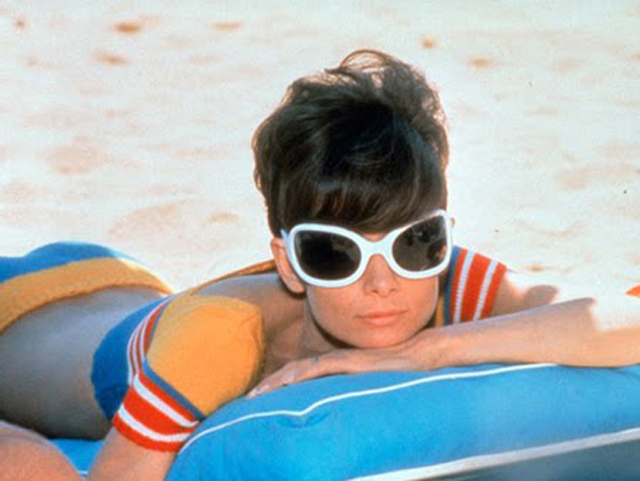 The iconic white sunglasses "YUHU" were made for Audrey Hepburn by London eyewear designer Oliver Goldsmith in 1966. Think V&A British Heritage. "YUHU" (1966) was featured in "Two for the Road" The exciting news is that Claire Goldsmith (great granddaughter) will re-issue this icon Spring 2018! They are amazing!